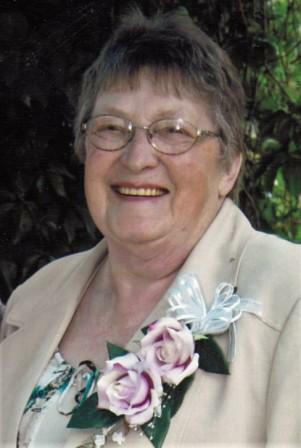 September 7th, 2015 marked the passing of Valerie Marlene Grace Watt (Moore, Blair) of Louis Creek, BC. Born August 23, 1941, in Chilliwack, BC Valerie spent the majority of her life in the BC Interior, meeting and settling in Louis Creek with her husband of thirty years, Bill Watt. Labour Day ended a five year battle with cancer when Valerie joined her parents Gordon and Doris Moore, and her beloved ‘Granny’ and Uncle Alf Wallace, in heaven. Left to miss her are her daughters, Brenda Erhardt (Dan), Jaqueline DeMille (Jeff) and Taunja Blair, as well as her five grandchildren Kristina, Brandon, Kassandra, Jasmine and Ryan and great-grandchildren, Rhianna, Kaycee, Elijah, and Tatum. Also saddened by the loss are her brothers Ernie (Cheryl) Moore of Chilliwack, BC, and Jan (Marla) Moore of McLure and her dearest friends Shirley Hawkings and Margaret Bradford from Barriere. Although circumstances prevented Valerie from graduating from high school, she valued education in all forms and obtained her GED at age 60. Not shy when it came to hard work, whether her required skills were for retail or housekeeping, green chain or grocery store, traffic control or newspaper office, Valerie embraced ‘on the job’ training, and her ‘watch me’ attitude was one that took her from waitressing at the Darwen to ownership and management of the Little Red Barn Restaurant. But it was no secret that by far, her favorite career was working on the ranch she shared with her husband. No funeral was held at Valerie’s request, but a special memorial will be held by family at a later date. Valerie’s spirit and ashes have found a resting place on a ‘ranch’ in Alberta, near her children. Anyone wishing to honor Valerie’s life may do so with a donation in her name to the Marjorie Willoughby Snowden Memorial Hospice House in Kamloops, where she received peace and exceptional sensitivity during her final days. The family also thanks the nurses at RIH and Drake Smith of North Thompson Funeral Services for the care they provided.